A website celebrates the legendary Russian writer's birthday by uploading several of his personal notes. On September 9, to mark Leo Tolstoy’s birthday, some of the author’s rare autobiographical writings – his diaries and notebooks – were uploaded to the website www.tolstoy.ru. This bibliographical rarity is free of charge thanks to a project called All Tolstoy in One Click. The volumes, which contain diary entries (volumes 46 to 58), can be downloaded as .fb2, ePub, .mobi, and HTML files. “We want to thank all of the volunteers who participated in proofreading Leo Nikolaevich’s texts,” said the writer’s great grand-daughter Fekla Tolstaya, who is in charge of the project. “Many people said it was the diaries that struck them most. Now anyone who is interested will be able to download or read this collection of Tolstoy’s thoughts online,” she said. Tolstoy made his first diary entry at age 18, in Kazan. His last entry was written four days before his death. There are 31 notebooks filled with diary entries – 4,700 pages in total, just 500 (handwritten) pages less than for War and Peace. In addition to his diaries in electronic form, Tolstoy’s notebooks, which he used while writing Anna Karenina and War and Peace, have also been translated. At the end of his life, Tolstoy considered his diaries to be his most important writings. In fact, he assigned much greater meaning to them than to his novels, or to any of his other creative work. “No longer a young man, Tolstoy argued about the interconnection of space and time in his diary. Incredibly shocking!” said Mikhail Rusov, an admirer of Tolstoy. “The topic of space and time is one of the key themes in the diaries of the 1900s,” said Vladimir Anyanov, a volunteer on the project. The All Tolstoy in One Click project was launched in the summer of 2013. Specialists examined 90 scanned volumes of the author’s writings using the ABBYY FineReader programme. Over 3,000 volunteers proof-read all of the texts in order to create a reference electronic version. Now anyone can read these rare writings, as well as Tolstoy’s diaries, on a tablet, smartphone, or e-reader. Fifty-four volumes are currently available for free download at www.tolstoy.ru. 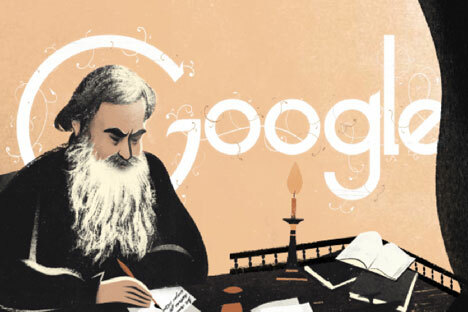 On September 9, the Google search engine featured an interactive Google Doodle dedicated to Tolstoy’s 186th birthday. The doodle, available in many languages, featured several illustrations of War and Peace and Anna Karenina, as well as the short story The Death of Ivan Ilyich. To the right of the doodle is a magnifying glass that the user can click on, leading to a search page for the keywords ‘Лев Толстой’, ‘Leo Tolstoy’, Léon Tolstoï’, ‘León Tolstói’, Λέων Τολστόι’, and the name of the great author in a variety of other languages.